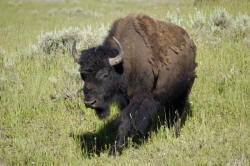 Below is information that might help you plan your trip to Yellowstone National Park. The index is provided so you can review individual items without scrolling through it all. Clicking on an item will take you to that topic as a starting point or at least close to it. Use the BACK BUTTON to return here. Why was this information consolidated? When should I start planning my trip? What kind of vehicle should I rent? Where should I stay while visiting Yellowstone? Should I stay in one place or move around? What are my dining choices in the park? What should I put in my ice chest? How long do I need to stay in the park? What do I need to take with me to have the most fun? What are the must see things in the park? What should I do for an itinerary while visiting? Are there things I should never do in the park? Should I save time to visit Grand Teton National Park? What other things should I consider for this visit? Do I have to have a spotting scope to visit Yellowstone? Tell me about the cowboy cookout. How do I pose a bison for a picture? Where do I park if I see a bear? Where do I look for wildlife? What about the hiking trails? Should I worry about the bears? What are some other on-line sources of information? What's that big group of cars up ahead? Can I park on the road to watch wildlife? What's the nicest resort in the park? Its March and I plan to visit the park in June. What should I do?